How Does Burnout Feel to a Horse? In the burned out horse, all defensive mechanisms are standing at “red alert” all the time, and the least little trigger can push the horse into an overreactive state. Consider the reactions of a normal horse as compared to those of a burned out horse: correct the normal horse spooking lest he hurt himself and he is likely to settle down; offer the same correction to a burned out horse and he may spook all the way into the next county or just drop you off right then and there. In the example above, you are correcting the horse for spooking so that he learns to behave and does not hurt himself. You have his best interest in mind, not to mention a sense of self-preservation. The normal horse can accept this correction, and probably even trusts that corrections are offered for good reason. The horse in burnout has no ability to process or think about the correction whatsoever, whether it is in his best interest or not. This horse lives in defensive overdrive, and goes straight for his best line of defense, whether that is bucking, rearing, running, kicking, biting, or simply refusing to move. More importantly, after his defensive maneuvers the horse is then likely to slide into whatever chronic illness bothers him the most. For instance, the Fire temperament horse may colic or his ulcers may flare. 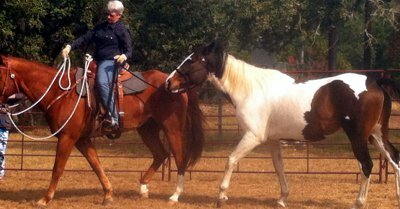 The Wood temperament horse may suddenly go lame because of a tendon that has been previously injured. Whatever the horse’s weak link in terms of his health, he will experience problems in that area. The takeaway lesson here is that if you are considering training or teaching a burned out horse without taking into consideration his state, you won’t get very far. The horse will not be able to process, absorb, or accept much of what you are teaching, and just about any amount of work will throw the horse back into a chronic illness. This is not to say that a horse in burnout cannot be trained because he can. You just have to take certain aspects of his temperament and condition into consideration. It is also important to note that a horse that has recovered from burnout also needs this kind of special treatment. Equine osteopath Janek Vluggen notes that even horses who have recovered from burnout can never return to their previous level of activity-which caused the burnout in the first place-but must be trained and worked at a lower level to prevent the reoccurrence of chronic health issues. If your horse suffers a major burnout episode the first step to recovery is to take him out of training and work, and allow him adequate rest. An example of a major burnout episode would be a Metal temperament jumper who has always been successful flatly refusing to jump anything in the show ring, accompanied by the onset of a respiratory infection. Since the lungs are the Metal horse’s weak link, that organ will be the first to show distress during burnout. Depending on your horse’s temperament type, rest could take on different forms. The Metal horse in the example above is likely to enjoy being turned out to pasture and left alone. The Earth horse will enjoy food, treats, and attention, while the Fire horse loves quality time with his chosen person. The Wood horse will need to be kept moving, either in pasture or out on trail, so he doesn’t destroy everything in his stall. Finally, the Water horse needs reassurance and safety during his rest period. You can read more about each of the horse temperament types in the Horse Harmony Book. Hormonally, the burned out horse is literally stuck in a defensive mode. The hormones produced by his body, such as cortisol, force him to overreact to everything. To shift a burned out horse into a resting state and out of that defensive posture, you have to change his hormonal state. There are a number of supplements that have been quite successful in helping horses shift. I list the three with which I have had the most success below, although it should be noted that burnout horses will have to be kept on these supplements for a long period of time before recovery occurs. Every horse has areas of chronic weakness when it comes to health. When a horse goes into burnout, that chronic ailment is guaranteed to reappear. Since a horse in pain cannot recover, it is important to treat that health condition, whether it is a gastric ulcer, a joint problem, or anhydrosis. Treating the chronic ailment along with the horse’s hormonal balance is the quickest way to bring him out of burnout. When a previously well-behaved horse suddenly becomes fractious or unmanageable, you have to consider whether burnout is causing the sudden change in the horse’s character. It’s one thing for a young colt to act out, and perfectly acceptable to discipline the horse for that behavior. However, the same discipline applied to a burned out horse will often result in even worse behavior. A burned out horse does not care why or how the discipline occurs. He only cares about fight or flight. Burnout can be caused by a number of factors. A horse constantly on the show circuit can literally reach the end of his rope, unable to face yet another round in the show pen. A horse in a job he hates will burn out quickly. Chronic sickness and pain are other causes, as is a sudden illness that lowers a horse’s position in the herd pecking order. A hard working competitive horse can burn out his adrenals and not have anything left to give. All of these conditions can contribute to burnout. If your horse matches any of these conditions, stop and consider how best to handle him. That moment of pause will bring you a more rewarding and productive relationship with your horse down the road.